Most people know they can save money by living in Mexico. What they don't think about is the ways that can affect their social life, for example how much more frequently they might be able to entertain. Once into my second year here, the time had come for me to to arrange my first cocktail party. The guests would be mainly Mexican. I knew that I would learn a few things about customs and taste buds. My evening plan called for guests to have a glass of wine, watch the sun set over the ocean from the deck downstairs, and then move upstairs to the apartment for some appetizers. If you don't trust your Spanish skills over the phone, you can entrust RSVPs to a friend, but beware. The day of the party, I queried my conduit as to how many were coming. Americans prefer the bald truth that enables us to plan and adjust our attitude and expectations, and how much wine to buy. Mexicans want you to be happy. They never want to be the bearer of what could be “bad news." They are more likely to answer a direct question with what they think you want to hear. In a party situation, this leaves you little idea of what will happen or how many people will be there. The estimate is usually quite optimistic. I am sure you have encountered a great deal of commentary on the Mexican concept of time, usually applied to the rather worn example of waiting for the gardener, electrician or handyman but not how it affects your entertainment planning. I had set the party for 5:00 p.m. expecting no arrivals until at least 6:00 (I'm no greenhorn to Mexico!). I sweated over the arrachera steak and a hot grill, still in my work-out clothes at the appointed hour of the party not in the least concerned about anyone arriving. A few people arrived by 6:15. Some were calling to tell me they were on their way after 9:00 that night, just as the first guests were leaving. If you are trying to introduce certain people to one another, it can get difficult. They'd meet as one was leaving, the other arriving. At home in Denver, sometimes we relied on on potluck dinners to enable everyone to get together frequently even when budgets were tight. As I planned my party in Mexico, several people insisted that I not worry or work too hard, that everyone would bring food, maybe something to drink. Fortunately, I didn't fall for that one. Mexicans are very generous, and women never come empty-handed, but expect something along the line of a gift, a jar of fancy olives for example, or cookies with a bow on the box you would not want to untie that night. They were more in line with a gift, not the standard bottles of wine you come to expect when hosting parties at home. I should have carried a panoramic camera for the hot sauce isle. I had hits and misses on my menu. Cream cheese is popular in Mexico, so cream cheese, meat and cheese rolled up in tortillas and sliced played well. Crusty loaves of bread that had been scored, injected with garlic butter and mozzarella and served as a pull-apart were hits. My arrachera steak looked like shoe leather, which I managed to ruin in spite of the warnings about how easy the thinly cut flank steak is to overcook. When going out in Mexico, you will notice more people drink beer, maybe an occasional margarita or pina colada, but in coastal cities in particular, the drink is beer. You can find wine just as easily in Mexico as the U.S. Consumption is lower. It’s rare for guests to drink more than a glass, perhaps two. You may have to buy the all the wine, since Mexican guests are less likely to bring it, but you buy less because they drink much less of it. Have more non-alcoholic drinks too (lots of Coca-cola!) Wine coolers seem more popular than at home. Serve wedges of lime in a small bowl and have hot sauce available. My Mexican girlfriends even put it on potato chips...and ice cream...and fruit. With hundreds to choose from, look for a thermometer on the bottle, that will give you a heat range. Another interesting thing I learned after this party when the weather cooled was that many of my Mexican guests only like ice in their drinks when it's hot outside. For years, I thought the paucity of ice in drinks had something to do with the cost of making ice. At an event, like a concert in the summer, it's very common for people to to order a glass of ice to pour their beer over. I know nothing about what this all means. I'll try to update this blog when I figure it out. The night of my party, I was curious how the idea of going into the pool would be received. Since the age of 30, I have not given a pool party, or at least not one where anyone was expected to actually got in the pool. My friends in Denver stay fully dressed and some have told me they have not been seen in a bathing suit publicly in years. I love swimming at night and thought I'd take a chance on fielding the idea in Mexico. Women are far more accepting of their bodies in Mexico. In that respect they are much more liberated than American women are. The prevailing attitude is “This is how I look. If it’s not for you, that’s your problem.” I love the way older women dress up here, how they continue celebrate their femininity. At this party, I was delighted to find that everyone had brought a bathing suit. It took one amiga demurely lifting her skirt to show me the rose-colored edge of her bathing suit she’d worn to get the hint that they were waiting for the go-ahead. Everyone jumped in the pool and we played in the water like people much younger than we are until well after the sun went down. The best part of the night was floating on my back in the cool, sparkling water of the pool, looking up at the Mexican stars with my new friends, and listening to their laughter as the surf crashed against the shore out in the darkness beyond. Party food you can most likely prepare from ingredients available in Mexico from our Pinterest board. Next up: Things were going so well...until your laptop keyboard goes out. Most recent: Low ticket prices to cultural events make exploring the arts affordable. 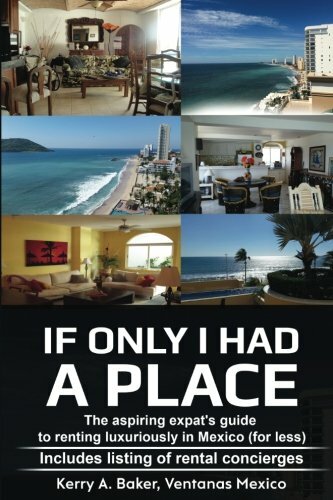 Hola - I'm a partner with Ventanas Mexico which provides insight and resources to those considering expat life in Mexico, including the book, "If Only I Had a Place" a how-to for aspiring expats renting in Mexico. I am also the author of the "Interactive Guide to Learning Spanish Free Online," a curation of the best Spanish language tools on the web. Prepare for real life in Mexico by learning to converse in the language. Experience the best tools, linked and organized into lesson plans.